What is the current rate of gas-bloat syndrom following open and laparoscopic antireflux surgery? Antireflux surgery has a well-established position in the treatment of gastroesophageal reflux disease. Postfundoplication symptoms are seen in a proportion of patients, and in some may undermine the success of the antireflux procedure. The term "gas bloat" describes symptoms caused by gaseous distension of the stomach due to an inability to vent gas from the stomach by belching. Upper abdominal discomfort and distension may be accompanied by sweating and dizziness. Symptoms are usually encountered after meals, and in particular after fizzy drinks. The term "gas bloat syndrome" is also used to encompass a range of related symptoms, including postprandial fullness, back, chest and shoulder tip pain, inability to belch to relieve bloating, inability to vomit, generalised abdominal bloating and increased passage of flatus. Most surgical series rely upon subjective assessment of symptoms with much variation in terminology, severity scoring and follow-up period. This inevitably contributes to the widely differing rates of gas bloat reported in the literature. With each swallow, 10-20 mls of air is introduced into the stomach. In normal circumstances this air is vented by gastroesophageal, followed by esophagopharyngeal gas reflux, i.e. "belching". This process is stimulated by distension of the gastric fundus. In normal subjects the majority of gastroesophageal gas reflux episodes occur during spontaneous (i.e. non-swallow induced) transient lower esophageal sphincter (LES) relaxations, which occur more frequently in the upright position . Gastroduodenal gas efflux seems to play a much smaller role in the emptying of gas from the stomach . In patients with gastroesophageal reflux (GER) and a defective LES, gas reflux also occurs during periods of prolonged LES hypotension. GER patients may be prone to aerophagy as a result of swallowing in order to neutralize symptomatic acid reflux with saliva, a learned behaviour pattern that may persist following fundoplication and contribute to postoperative bloating. A number of techniques have been employed to assess objectively the influence of fundoplication on subjects' ability to belch. Smith et al. assessed belch volumes by distending patients' stomachs with carbon dioxide and collecting belched air in a closed container system. After antireflux surgery, patients had a lower volume of individual belches and a reduced overall amount of belched gas compared to volunteers. However, no association could be shown between the volume of gas belched and gas bloat type symptoms. The yield pressure of the gastroesophageal junction (GEJ) has been used as an indicator of gastroesophageal competence before and after surgery. It is determined by measuring the intragastric pressure required to open the GEJ, thus allowing equalisation of gastric and esophageal pressures. Yield pressures are significantly lower in patients with esophagitis than in healthy controls, and fundoplication causes an increase in yield pressure  that is irrespective of a change in the basal LES pressure . However, the relationship between yield pressure, fundoplication technique and postfundoplication symptoms has not been addressed. Johnsson et al. used the manometric appearance of equalization of gastric and esophageal pressures (the so-called "common cavity phenomenon") as a surrogate marker of gastroesophageal gas reflux in patients before and after open 360° fundoplication. Fundoplication reduced the number of common cavity episodes and the number of transient LES relaxations following gastric distension without affecting the basal LES pressure. Rydberg et al. used similar methods to compare total (360° Nissen-Rossetti) fundoplication and posterior partial (270° or Toupet) fundoplication. Common cavity episodes occurred more frequently in patients who had a Toupet procedure than in those who had a total fundic wrap. In addition basal LES tone was significantly higher after a total wrap, as was the nadir LES pressure after water swallows. However no attempt was made to correlate these findings with the patients symptoms post fundoplication. More recently, Tew et al. found that half of their post-Nissen fundoplication patient group reported the ability to belch, but no patient had a common cavity associated with a belch urge. This was in contrast to a control group in whom 48% of belch urges produced a common cavity. This raises the possibility that when reporting the ability to belch postoperatively, patients are in fact describing the venting of air retained in the esophagus rather than true gastroesophagopharyngeal gas reflux. This may help explain the observed discrepancies between the ability to belch and the ability to relieve bloating by belching, the latter being of more importance clinically. The role which gastric emptying plays in post fundoplication symptoms is unclear. A proportion of patients with GER have delayed gastric emptying preoperatively, and it has been suggested that failure to improve gastric emptying is a factor in the development of post fundoplication symptoms . Delayed gastric-emptying of solids preoperatively may help predict those patients who develop long-term postoperative symptoms of bloating and early satiety . [16, 17] have claimed a reduced rate of postfundoplication symptoms but these claims have yet to be confirmed in randomized controlled trials. Equally there have been few randomized trials comparing the incidence of postoperative symptoms following fundoplication performed open and laparoscopically, although in non-randomized studies the incidence of gas-bloat produced laparoscopically seems to mirror that produced by open surgery. Comparisons of different laparoscopic techniques with short-term follow-up suggest that patients are more likely to be able to belch and less likely to complain of increased flatus if they undergo anterior partial fundoplication as opposed to total fundoplication . Division or preservation of the short gastric vessels in the formation of a laparoscopic 360° wrap does not appear to influence gas bloat symptoms  . Information on longer term follow-up by necessity comes from studies of open fundoplication. These suggest that gas bloat can persist for many years following surgery. In their 20-year follow-up of 25 patients who underwent Nissen fundoplication, Luostarinen et al. identified nine patients with bloating and fifteen who were unable to belch. However none of their patients cited these symptoms as a cause of unsatisfactory outcome. An earlier report from the same group showed that patients with impaired belching postoperatively had significantly greater increases in flatus, although these symptoms were described as severe by only 1 patient out of 109 . Most patients with gas-bloat symptoms postfundoplication will describe their symptoms as minor in comparison to the GER symptoms for which they had their surgery, and can be managed with a combination of reassurance, and general advice (avoiding fizzy drinks, heavy meals, etc.). The perception that symptoms improve with time receives limited support from the literature, with it being equally likely that patients simply become more tolerant of their symptoms with time. Endoscopic balloon dilation of the GEJ is of proven benefit for post fundoplication dysphagia, but may also be helpful for gas-bloat. The occasional patient with intractable symptoms can be offered re-operation, with the option of converting a total to a partial fundoplication. Other aspects of laparoscopic antireflux surgery (conversion rate, re-operation rate, postoperative dysphagia rates, etc.) have been shown to be dependent on surgical experience, both individual and institutional, and no doubt the same applies to gas-bloat symptoms. Regardless of this, severe post fundoplication bloating is rare, and minor degrees of bloating may be seen as an acceptable price to pay for a successful antireflux procedure. 1. Wyman JB, Dent J, Heddle R, Dodds WJ, Toouli J, Downton J. Control of belching by the lower oesophageal sphincter. Gut 1990;31:639-646. 2. McInally E, Kelly E, Inglefinger F. Mechanism of belching: effects of gastric distension with air. Gastroenterology 1964;46:254-259. 3. Smith D, King NA, Waldron B, Cullen PT, Millar B, Fenwick M, Campbell FC. Study of belching ability in antireflux surgery patients and normal volunteers. Br J Surg 1991;78:32-35. 4. McGouran RCM, Galloway JM, Wells FC, Hendrie ORS. Is yield pressure at the cardia increased by effective fundoplication? Gut 1989;30:1309-1312. 5. Ismail T, Bancewicz J, Barlow J. Yield pressure, anatomy of the cardia and gastro-oesophageal reflux. Br J Surg 1995;82;943-947. 6. Johnsson F, Holloway RH, Ireland AC, Jamieson GG, Dent J. Effect of fundoplication on transient lower oesophageal sphincter relaxation and gas reflux. Br J Surg 1997;84:686-689. 7. Rydberg L, Ruth M, Lundell L. Mechanism of action of antireflux procedures. Br J Surg 1999;86:405-410. 8. Tew S, Ackroyd R, Jamieson GG, Holloway RH. Belching and bloating:facts and fantasy after antireflux surgery. Br J Surg 2000;87:477-481. 9. Hinder RA, Stein HJ, Bremner CG, DeMeester TR. Relationship of a satisfactory outcome to normalization of delayed gastric emptying after Nissen fundoplication. Ann Surg 1989;210:458-465. 10. Lundell LR, Myers JC, Jamieson GG. Delayed gastric emptying and its relationship to symptoms of "gas bloat" after antireflux surgery. Eur J Surg 1994;160:161-166. 11. Lundell L, Abrahamsson H, Ruth M, Rydberg L, Lonroth H, Olbe L. Long-term results of a prospective randomized comparison of total fundic wrap (Nissen-Rossetti) or semifundoplication (Toupet) for gastro-oesophageal reflux. Br J Surg1996;83:830-835. 12. Walker SJ, Holt S, Sanderson CJ, Stoddard CJ. 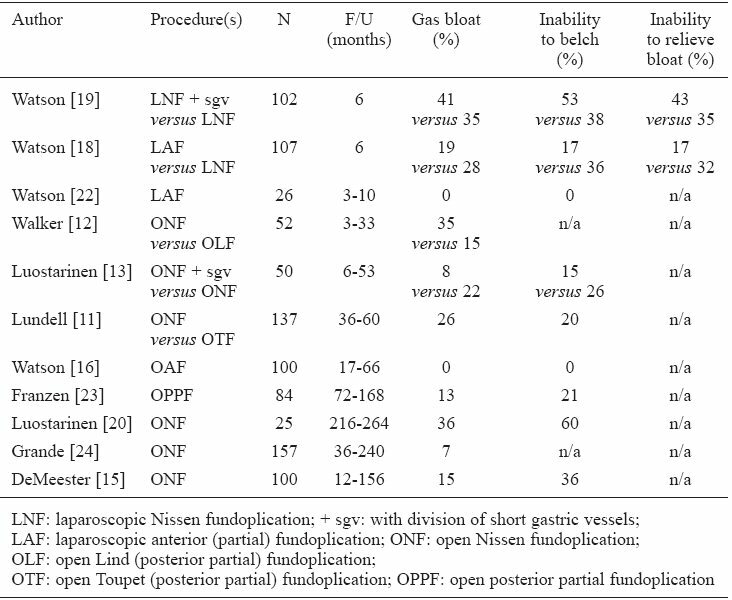 Comparison of Nissen total and Lind partial transabdominal fundoplication in the treatment of gastro-oesophageal reflux. Br J Surg 1992;79:410-414. 13. Luostarinen MES, Isolauri JO. Randomized trial to study the effect of fundic mobilization on long-term results of Nissen fundoplication. Br J Surg 1999;86:614-618. 14. DeMeester TR, Johnson LF, Kent AH. Evaluation of current operations for the prevention of gastroesophageal reflux. Ann Surg 1974;180:511-525. 15. DeMeester TR, Bonavina L, Albertucci M. Nissen fundoplication for gastroesophageal reflux disease. Evaluation of primary repair in 100 consecutive patients. Ann Surg 1986;204:9-20. 16. Watson A, Jenkinson LR, Ball CS, Barlow AP, Norris TL. A more physiological alternative to total fundoplication for the surgical correction of resistant gastro-oesophageal reflux. Br J Surg 1991;78:1088-1094. 17. Hill LD. An effective operation for hiatal hernia:an eight year appraisal. Ann Surg 1967;166:681-692. 18. Watson DI, Jamieson GG, Pike GK, Davies N, Richardson M, Devitt PG. Prospective randomized double-blind trial between laparoscopic Nissen fundoplication and anterior partial fundoplication. Br J Surg1999;86:123-130. 19. Watson DI, Pike GK, Baigrie RJ, Mathew G, Devitt PG, Britten-Jones R, Jamieson GG. Prospective double-blind randomized trial of laparoscopic Nissen fundoplication with division and without division of short gastric vessels. Ann Surg 1997;226:642-652. 20. Luostarinen M, Isolauri J, Laitinen J, Koskinene M, Markkula H, Lehtinen E, Uusitalo A. Fate of Nissen fundoplication after 20 years. A clinical, endoscopical, and functional analysis. Gut 1993;34;1015-1020. 21. Luostarinen M. Nissen fundoplication for reflux esophagitis. Long-term clinical and endoscopic results in 109 of 127 consecutive patients. Ann Surg 1993;217;329-337. 22. Watson A, Spychal RT, Brown MG, Peck N, Callander N. Laparoscopic "physiological" antireflux procedure: preliminary results of a prospective symptomatic and objective study. Br J Surg 1995;82:651-656. 23. Franzen T, Bostrom J, Tibbling Grahn L, Johansson KF. Prospective study of symptoms and gastro-oesophageal reflux 10 years after posterior partial fundoplication. Br J Surg 1999;86:956-960. 24. Grande L, Toledo-Pimental V, Manterola C, Lacima G, Ros E, Garcia-Valdecasas JC, Fuster J, Visa J, Pera C. Value of Nissen fundoplication in patients with gastro-oesophageal reflux judged by long-term symptom control. Br J Surg 1994;81:548-550.